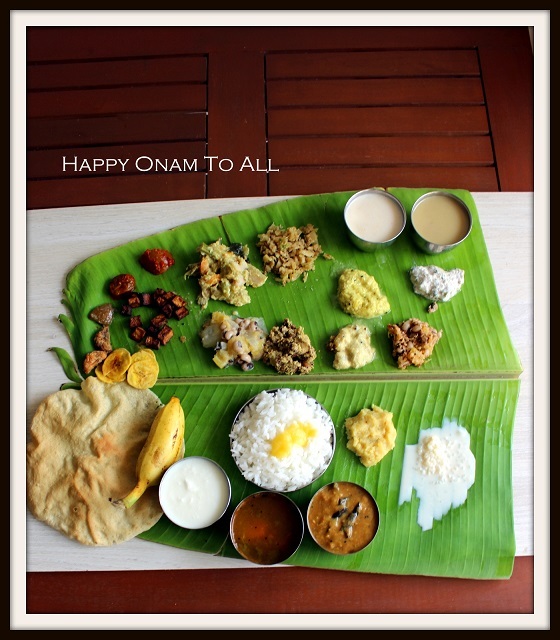 Wishing all those who celebrate, a very happy Onam..
What is Onam without the OnaSadya? As Monday is a working day for my husband, I made the sadya yesterday. The above was our spread. There are about 24 items served there in the leaf. Nothing brings more happiness than a full stomach and I cannot be happier than I am right now :-). Coming to the letter of the day ‘Mmmmm’, I have two recipes to share. One is the all time favourite Mambazha Pulisseri (ripe mangoes cooked in tangy yogurt and served as a gravy for rice) and the other is a pachadi made with pumpkin. For Pulisseri with ripe mangoes, usually the ‘nadan'(local) variety of mangoes are used. It will be the fibrous slightly sour kind. The idea is that you don’t have to spend money to get the top grade mangoes for this curry. Just use the ones that aren’t sweet to be consumed as such. The curry will be slightly sweet and tangy in taste. You can either discard the seed at the time of cooking itself or use can just cook the seed with the flesh around it and discard it at the time of eating. Its fun to take the fruit around the seed with your hands. Messy, but tasty! You can use other vegetables like raw bananas, yam, ash gourd, pumpkin, taro roots etc for making this. Other fruits to use would be not too ripe bananas (nendran variety) and papayas. Please share if you know any other fruit that is used in Pulisseri. The difference between kalan and pulisseri is that kalan is a concentrated form of Pulisseri and can be preserved for months in an airtight bottle where as pulisseri is freshly made and consumed with in a day or two (if refrigerated). Wash and clean the mango. Chop off the stem portion. Slice the two cheeks off and cut them into 4 pieces. Retain the seed with the ring of fruit around it. Add water till the mango is covered, add turmeric powder and salt. Cook till the mango is done. Grind the coconut with chilies and jeera. 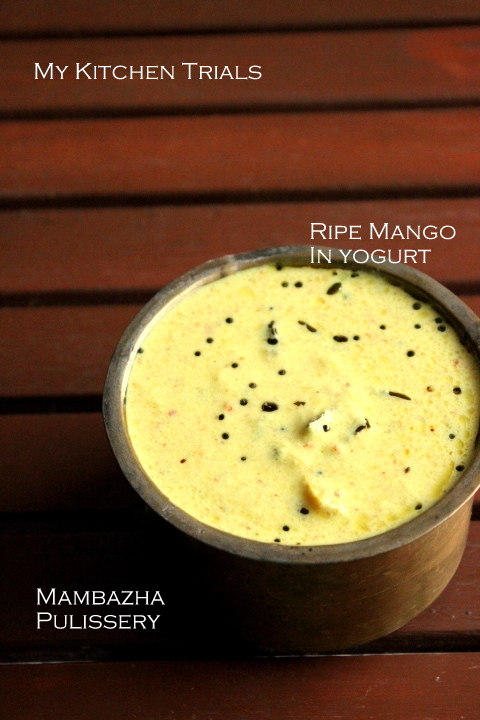 Once the mango is cooked, add this paste to it and bring it to a boil. Cook for 2-3 minutes. You may have to add water if there isn’t enough in the pan. In the same mixie jar, blend the yogurt for a few seconds. You can do this in a bowl too using a ‘mathu’ or whisk. Basically you need to break the yogurt so that no lumps remain. This also helps in yogurt not splitting when its hot. Add this to the boiling curry and let it cook for a minute in low heat until it reaches the boiling point. You will have to stir to avoid the yogurt from splitting/curdling. Take the pan off the heat once it reaches boiling point. Even if the pan sits in the hot stove, yogurt might split. In a small tadka pan, heat the oil and add the red chilies and mustard seeds. Once the seeds crackle, add the fenugreek seeds and curry leaves. Once it turns brown, take off the heat and add to the pulissery. Serve with rice and a side dish. I am making this for the first time. I have followed the same method I use for the other pachadis. A bit of jaggery is added to sweeten it a bit. Pumpkin by itself will render sweetness to this dish. 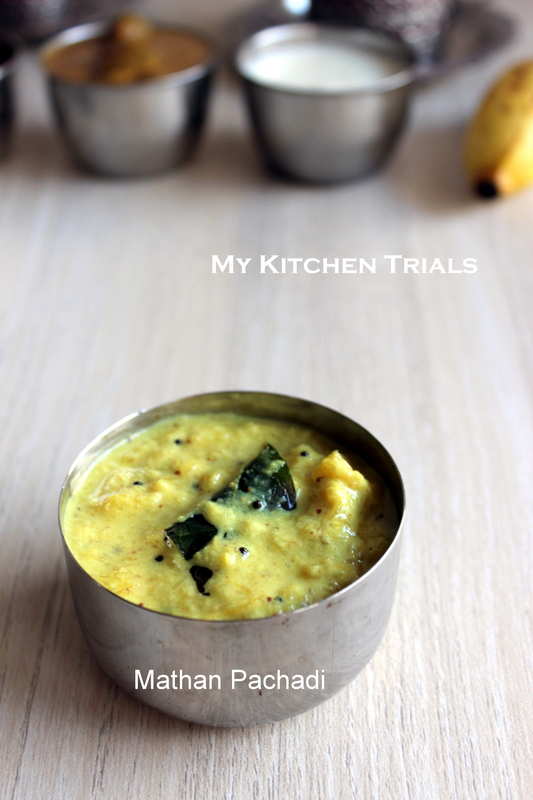 This pachadi can be made in a different way as well. In that, pumpkin is cooked in tamarind water. So the souring agent is tamarind instead of curd. Wash, clean, peel and dice the pumpkin. Add very little water, turmeric powder and cook in a pan till its done. Meanwhile, grind the coconut, mustard seeds and chillies to a fine smooth paste. Again, add only as little water as possible, we don’t want a runny pachadi finally. Add salt and the coconut paste to the cooked pumpkin and let it boil for 3-4 minutes. Take off the heat and add the yogurt. Mix, taste test and keep aside. For seasoning, in a small pan, add the oil. Heat and then add the mustard seeds and red chillies. Once it splutters, add the curry leaves. Wait for it to change color. Top the pachadi with this tadka. My friend’s pookkalam two days back. She call’s it ‘The Woman’. Nice, isn’t it? wish you a happy onam dear lovely pookalam and fabulous spread :) I too tried this mampazham pulisery yesterday :) looks super delicious and i know it tastes fabulous :) makes me drool dear !! Lovely pookalam ! Wow , the mango curry sounds delicious . Mathan pachadi is new to me ..
Omg, wat a delightful mambazha pulissery, i seriously want to make them,but none at home love mambazham in spicy avatar, wish i could make atleast once in my life. Delicious pachadi too. @valli and pavani, there are 24 dishes in there but the chips & pickles Were outsourced (MIL and store bought). Usually these are also made at home, but i didn’t…Banana is not ‘made’ :D and things like ghee, curd and rice are minimal effort items. It’s mainly the side dishes and the sambars that are made. I had never heard of mango curry this way. Looks like a must try next mango season. 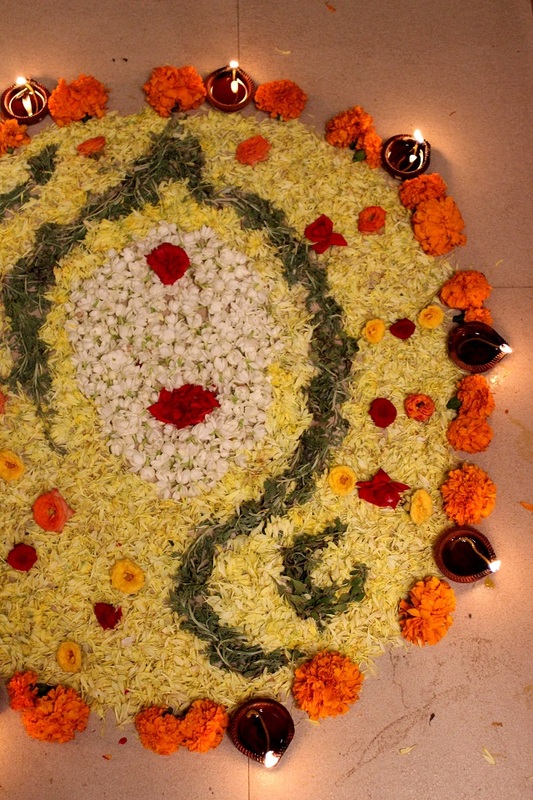 The pookolam is beautiful. And girl, you prepared 24 dishes for that festive platter. Kudos to you. bookmarking this delicious pulissery!! I have tasted this on my recent vacation in Wayanad!! Wow recipe look amazing with flavorful spices. Love the flower decor, its amazing. OMG 24 dishes!! Hats off to you ! Love the festive spirit..A beautiful flower arrangement as well! Mate ape dhanya hai! What a lot of effort Rajani. I must say that these are amazing dishes. So amazing that I have corrected my spelling 4 times now. These dishes are making me so hungry that I ma eating my words. The Woman is beautiful. Pleae congratulate your friend.